It's no secret, The Train To Crazy is the catchiest, weirdest blog name you've seen lately. Am I right? I named it on a whim 6 years ago when I thought the only people who would be reading it would be my mom and dad. (hi Dad). Well, things change and it morphed and grew out of the little family blog it was into something totally different and great. Over time I've cringed at the name more than a few times but let me tell you something you already know. It is really hard to get off the train to crazy. Am I right? So the name has stuck. Partially because I could never find a better name and partially because I was afraid you'd all leave me because you would be like, "who's this?". Or something similar. So, it has stuck. I've actually purchased 3 different domain names planning to change but never could. I asked on facebook what you thought about changing the name and the response was a bit lopsided. I honestly didn't expect that. I figured there'd be more level headed people in there telling me it just isn't good marketing to call yourself anything related to trains or crazy. But, most of the responses said to keep it and not just keep it but they used exclamation marks. We all know that those aren't tossed around lightly. So I'm keeping it. For now. Until I find a better name. Or until I grow old and gray. (that's a trick because I'm already going gray and definitely growing older). At any rate, don't expect to type in thetraintocrazy.com and find a redirect to something snazzier or more descriptive of the actual content anytime too soon. You may, however, notice a few changes around there soon. I'm leaving typepad. Not because I don't love typepad (I do) but because I just need something a little more than typepad can give me easily. So I'll be migrating to wordpress shortly. I'll still be me and you'll still be you but this site will just look a little different. Hopefully better and easier to navigate. We'll see. There is just one other change happening. I've changed AndreaPannell.com a bit to help organize my online life. It's a good landing spot for anyone interested in me and my companies and what not. It's not complete, you'll probably notice that. I'm working on different parts of it still but I'm stuck on my about page. I'll get through it but go take a look anyway and let me know what you think! Happy Thursday!! It's Make It Wear It time! Chocolate pudding is always a favorite with kids. Add some berries or fruit and it's a fairly healthy treat! This version is gluten free and dairy free and only has a few ingredients. Plus it is sweetened with natural maple syrup. Yum! Serve the pudding in cute little dessert glasses for a fun party idea! Or dip some berries into the pudding before it sets for chocolate covered berries. Fun for girls' night out! Or make a sweet after school snack. In a medium sauce pan, wisk together the first four ingredients. Over medium heat, bring to a boil then reduce to simmer. Wisking frequently, cook for 15 minutes until pudding begins to thicken. Remove from heat. Cool then cover and refrigerate. Now go enjoy this guilt free treat! Today I'm joining in A Crafty Cristmas on Nap-Time Creations! Hop over for a giveaway! Are you wanting a new camera? Or maybe one to give someone special on your Christmas list? I'm giving a Canon T3 away today! It comes with an 18-55mm lens and takes beautiful photos! What's better? We didn't want to leave out our overseas friends so we're giving this gift in the form of a $400 Amazon.com gift certificate! Use it to buy the camera or anything else on your list! Maybe even that serger you've been eyeing! Welcome to The Train To Crazy! My name is Andrea. You can read about me here or check out my sewing patterns, my other blog or search through my tutorials. I'm also a member of the Pattern Anthology team! I'm excited to announce that we are giving away 8 PDF sewing patterns. 2 from each of the Pattern Anthology team. Please visit See Kate Sew, Shwin Designs, Blank Slate Patterns and my shop, Go To Patterns to see which patterns you'd want to win. Have you been making anything?? It's time to link up to Make It Wear it! I've made a few things too! Did you miss them? The Belinda Dress and some new Holly Trouser shorts and pants! Now what have you made? New Pattern! The Belinda Dress is now for sale! Today I released a new sewing pattern at GoToPatterns! The Belinda Dress is one of my favorites so far! It's what I call "casual comfort". My 5 year old has been wearing all of her Belinda Dresses non-stop, even to bed. That's a win! And even better? It's ON SALE today only! I designed this pattern as part of the Designer's Challenge. It's a fun challenge I put out to other designers to create something unique to the market, or at least a challenge to them. We've got lots of designers participating and there have been some great releases so far. They love the pockets. Love, love the pockets. Making and sewing DIY clothes and accessories for school aged kids can be tricky. Most are no longer interested in frilly dresses with novelty prints. Chosing fabric and patterns can be tough and sometimes you sew for hours only to have a less than enthusiastic recipient. You can see my Top 10 Tips for Chosing Fabric for Children's Clothing but it isn't just about fabric. The patterns make a HUGE difference. And don't forget accessories! I'm hoping to showcase some Elementary Styles over the next few months to help you choose patterns that work well and are appropriate for children, yet grown up enough for children in school. My girls are saving money right now to help send kids to school in Africa where my brother lives. They each earned money for this photo shoot. It was COLD outside! I had so much fun posting the Will Smith Video yesterday that I had to show you another fun one today. It's Thanksgiving Week here and I'm busy doing non-blog related things so please enjoy this Hunger Games trailer from Honest Trailers! It's quite funny and pokes fun at the movie. I'm a huge fan of the books and movies and thought this was hilarious. *note that there is some adult language bleeped out in this video so you might not want to watch around children. If you've been having a bit of a down day then this video is for you. I have watched this a few too many times. If you ever watched The Fresh Prince then you'll want to watch this through to the end. Ok, now that you've seen it, let's forget about the "Hello! Hello!" and talk about how awesome it is to see Will & Alonso together again??? And Jazzy Jeff?? Brings back good memories. Now tell me this doesn't make you happy. Well, it's come time that my perfect eye sight has faded and I'm the lucky winner of farsightedness AND nearsightedness. You know what that means, right? BIFOCALS. What? I'm only 35, this isn't fair! So I've been looking for the perfect glasses. I've gone into every discount place and local strip mall eye shop just to check out the selection. I'm never in love with anything!! However, I've finally found four pairs I like!. I did the in-home try on for Glasses.com. If I had an ipad I could have done virtual try on, which would have been so nice! But I got to feel these on my face, and there's something to say for that. Setting the table for Thanksgiving, or any event or holiday, is really fun for some people, and totally overrated for others. I'm a bit more on the overrated end of the spectrum but I do appreciate a pretty plate, a nice napkin and something fun. This Thanksgiving we'll be using our name placecards, new cloth napkins and this fun centerpiece. Make It Wear It is back! Please come link up anything you've been making to wear. Whether it is refashioned, sewn, knitted, jewelry or accessories please let us see! I can't wait to see what you've all been making! Today I have the honor of joining the Simple Sewing book tour. Simple Sewing: 30 Fast and Easy Projects for Beginners written by Katie from The Red Kitchen. Learn to sew straight lines, clip corners, turn, topstitch and all the other basic things you need to master before moving on to sewing difficult projects. My daughters were so excited when this came in the mail. They poured over the pages, deciding what they were going to make first. I love that each thing in the book has thorough step by step instructions and photos. Some sewing books tend to skip steps or assume a lot of knowleldge but this one is very detailed. My youngest daughter even played hooky to sew with me (well documented on instagram, of course). Which reminds me, I changed my instagram name to my real name, in case you've been confused. We chose 2 projects to make first. My first choice was handwarmers. It wasn't the cutest thing in the book but it's really cold here. I know it's not cold to some people but we're freezing. The midwest is much, much colder than southern california. My 5 year old commented the other day that she wasn't sure we'd survive the winter. Well, now we have handwarmers to our rescue. And we even bought jackets and mittens so we should make it. The book calls for using flannel. Flannel is nice, and we had a variety in the stash. But we opted for minky. One day at the Loft there was TONS of minky. I almost bought more than I could ever use, but Bev talked me down and instead opted for some small pieces. This was one of them. Perfect for handwarmers! This kids were really skeptical that we filled them with rice and the rice would keep them warm. I love seeing them get excited about the little things. Next we made a couple toy cameras. This pattern is so cute! Getting a photo of both together proved difficult. I've never been one for a setting a fancy table but there is something so cute about name placecards at a table. I made these a few weeks ago and my children use them every night for dinner. It took me 10 mintues to make these but they'll be enjoyed thoroughly until we make a new set. This easy name placecard tutorial is sewn but you don't have to sew it! This can be a no sew tutorial if you don't have a sewing machine! Final day to buy the Winter Wonderland Collection 40% off! Well, the Winter Wonderland Tour is wrapping up! Today is the LAST DAY to buy the Winter Wonderland full collection or either of the mini collections (boy or girl). They'll be available individually tomorrow at full price or you can get them about 40% off today! Thank you to all the talented tour bloggers! THANK YOU to all the fantastic bloggers who took time out of their busy lives to make some of our patterns and share them with the world. This tour has been a huge success so I can't thank you enough!Did you miss anything? Please go check them all out. You won't be dissappointed! Click on any thumbnail to go see more of the look. I don't think I can pick a favorite. So much cuteness and variety! Isn't it amazing what you can do with 8 patterns? Next up on the Winter Wonderland tour is Jill from Made with Moxie! She's made some really cute sibling outfits! Head over to her blog to check them out! Make sure you check out her blog and tutorials as well! Taking photos of 2, 3, 4 or more kids is often an excercise that feels somewhat like a circus. Getting everyone to sit still, stop making funny faces, and for goodness sake stop putting your hand in front of your sister's face, can be challenging. Sabra from Sew a Straight Line has managed to accomplish the impossible! She's also got some fantastic tips for making or buying clothes for photos! No more matchy matchy! Head over to sew a straight line. You'll be there for a while because her blog and skills are amazing. You'll also notice her young chaps (and little lady) are fully outfitted in Winter Wonderland. Whoa, this lady can SEW! Shannon, from googiemama, is up next on the Winter Wonderland Tour! She's made some Juliet Capelets and Amarylis Dresses and I can't wait to see her post. Speaking of, did you see her post yesterday?? Those look so fun!! So head over and check out her blog! Miriam from Madmim is incredible. I love seeing her creativity. She never does anything plain. Miriam remixed the Trapper Hat. I love what she has done with it. Make sure you also check out her maternity sewing, and all her fantastic tutorials and inspiration! Don't forget to check out the tour bloggers over at Melly Sews, Shwin & Shwin, and See Kate Sew. Fabric gift bags are quick and easy to make. These "Go To" Gift Bags are unlined (one less step!) but have french seams so the inside looks clean and professional! There is a small, medium, and large size gift bag pattern and tutorial as well as a wine bag pattern and tutorial and felt gift card tutorial. Sewing your gift wrap!! Keep reading to see how you can get this PDF pattern for free! Heather, from Feathers Flights is on the tour today with an amazing Birkshire blazer and a fun looking infinity scarf tutorial. Check out all her other fun tutorials too. Suede moccasin boots with fringe. We're in love with these. Perfect for the fall. An excellent accessory to leaf kicking. This Winter Wonderland tour has been so much fun. A huge thanks to Minnetonka Moccasins for giving us these adorable boots to accessorize our patterns! You can win a pair of Minnetonka Mocs too! Just enter the giveaway below. We have another fun Sweet Bonnie Top remix today by sewpony.I can't wait to see what she's done! You'll also want to check out sewpony's great series, When We Were Young or the Secret Squirel. Both so original! This is the FINAL WEEK of the Winter Wonderland Collection. These collections are on sale 25-40% off. You can't beat that! They'll be available full price in a week. If you don't know It's Always Autumn you are in for a treat!! I love everything she makes. This is no exception!! She's done a refashion with the Sweet Bonnie Top! Isn't this adorable?? If you love that you'll love all her sewing, printables and recipes. This is one of my favorites. Head over to explore all of the It's Always Autumn goodness! The amazing Vanessa from Designs by Sessa is a BUSY foster mom, birth mom and pregnant lady. She somehow managed to whip up this adorable dress for her sweet little foster daughter. She also has a scarf tutorial and I can't wait to see it! Choosing fabric for children's clothing can be tricky. The fabrics available in many local stores lend themselves well to quilting and home decor but often not clothing, especially for children. Left with few option, most home sewists turn to quilting cotton. This can work great for structured dresses or ruffly skirts but not for other garments, especially pants and tops. Today on the tour we have Veronica from Sew Very. I got to meet Veronica last year and she's just the sweetest! 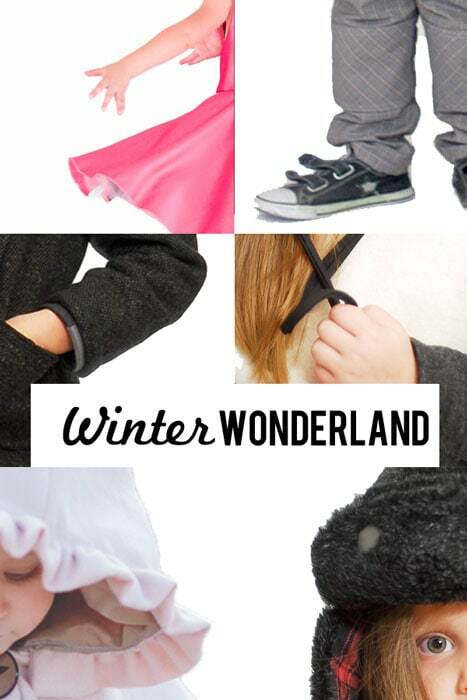 She's put together a Kid Style post using a couple Winter Wonderland patterns I think you'll love. What a fun use of pleather. Head over to her blog to read more! Check out the whole collection now! The Winter Wonderland Tour continues! Today Rachael from Imagine Gnats is sharing her pattern remix. This lady sews ALL THE TIME. She seriously makes dozens of garments each week. Her girls are outfitted head to toe in things she's made. I can't wait to see how she remixes the new Winter Wonderland sewing patterns for boys and girls! There has been a little bit of confusion about the pattern collection. You can purchase the FULL pattern collection or either of the mini collections for just BOYS or GIRLS. We're kicking off 2 weeks of the Winter Wonderland Tour with my friend, Karen from One Girl Circus. Karen is sharing a scarf tutorial she made for her adorable daughter. If you're not familiar with Karen, you should be. She's an amazing seamstress. She's written patterns and books and sews nonstop. It's such an honor to have her on the tour! I am over at Skip to my Lou guest posting today for the Holiday Bake Craft Sew Along today. I also have a fun giveaway for you here! I'm sharing some fun placeholders I made for my holiday table. Hop over th Skip to My Lou if you want to learn how to make these! I get to treat you to a SEW Amazing giveaway as part of our crafty series. This is one AMAZING giveaway! We are giving away a fabulous Prize Package worth more than $1000! 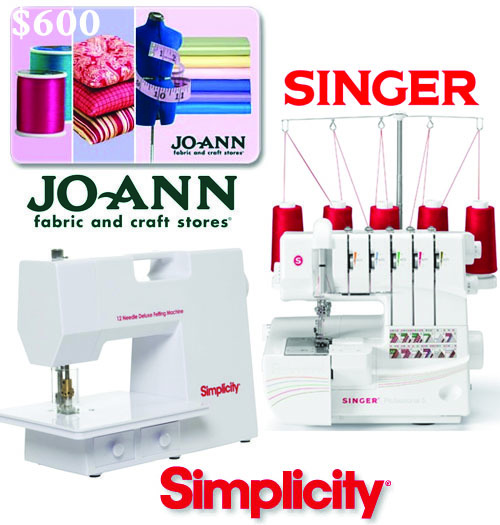 $600 JoAnn Fabric and Craft Stores This will get your sewing room stocked and ready to create! Can you imagine? Stitch width adjustment-keep seams strong and prevent bunching on any type of fabric. Simplicity Deluxe Felting Machine Simplicity 12 Needle Deluxe Felting Machine creates felting with ease. Removable needles & foot pedal allow felting with greater speed and precision. Includes: power supply w/ foot pedal, 2 allen wenches, needle shaft with 12 needles inserted (sz 38 needles), 3 replacement needles, tweezers, lint brush, needle guard, instruction book. So cool! Be sure to check out all the fabulous sewing projects shared this month for this Holiday Bake Craft Sew series going on all month long! It's here! Pattern Anthology is back with the Winter Wonderland Collection! This full, 8 pattern collection, is perfect for holiday photos! Buy the sewing patterns at a deep discount for two weeks only! Get the 4 boy or girl patterns in a mini collection or buy the full collection with all 8 patterns and sew up adorable pants, shirts, hats, blazer or a dress for your whole crew. Thank you to our wonderful sponsors of this collection. Mood Fabrics supplied all the fabric you see in these photos, Minnetonka Moccasins gave us the adorable shoes, and One Little Belt donated the belts! And good news! We're giving away $100 to Mood, a pair of moccasins and $50 for One Little Belt! Keep reading! Keep reading to see the rest and win! FLASH Giveaway! Winter Wonderland Collection! Yes, you read that title right. Winter Wonderland won't release until Monday, but I'm giving you a sneak peek below and you get a chance to win it before you can buy it. Yay!! If you've enjoyed Pattern Anthology before you'll be excited for this collection! To enter, enter your email address below, hit yes, and submit. That's it. One entry per person, winner gets the entire 8 pattern Winter Wonderland PDF sewing pattern collection. Open to US and international residents. Void where prohibited. Contest runs now through November 3, 2013 at 8pm Central Standard Time. Contest closed. Winner has been contacted. See who it was HERE. So, I felt bad I hadn't made one costume this year. Last year's costumes were still exciting for the kids and I've been very busy working on the next release from Pattern Anthology. But today I couldn't help myself. I made a superhero cape for our dog. It was easy and quick and you still have time to make one if you live in the west. Just some felt and a belt buckle. Couldn't be easier! No finishing edges! I'll have to take some photos of it on her for you. It's Thursday!! Please link up to Make It Wear It! Here are a few of my favorites linked up from last week. Nikki from Fancy That made New Look 6097 because of great reviews on Pattern Review and she loves it. Looks amazing! Jamie from Scattered Thoughts of a Crafty Mom sewed up this gorgeous angel dress and shared a tutorial. 12 delicious fall soups you'll love! It's that time of year where a quarter of the world starts thinking about stews and hot cocoa. And the rest just gloat that it's warm and sunny and they're on a beach. But with cooler weather comes the desire for warm soups, hearty meals and anything cooked in a crockpot or on the stove. I've found 12 tasty fall soups you'll love! Start warming up your soup pan because these look so hearty and delicious you'll want to make one tonight! I don't know about you, but I like decor that's low fuss. Nothing overly complicated or difficult/expensive. I was asked by Jo-Anns to write a post about #spookyspaces and I kept drawing a blank. I like Halloween. It's fun. The kids love it and my new neighborhood seems to really get into decorating. There are some pretty elaborate yards happening around me. But that just isn't me. Not right now, anyway. I wanted something easy but that wouldn't be a 2 week item and then stored for a year. So, I headed shopping and kept getting drawn to these cute baskets and all the fake flowers. But a basket with flowers doesn't really scream spooky. Except when you put fake cobwebs and spiders on them! Voila! A budget smart decision! Some cute fake flowers, a basket for each side of my front door, and some fake cobwebs and spiders! This simple project will take me all the way through Winter, adding variety without breaking the bank. But, that little bit of cobwebs wasn't really cutting it in the spooky department. So I pulled out a planter I had let the flowers die in. Perfectly spooky. Sometimes lazy pays off! Add a little more cobwebs to the trees out front and we've got #spookyspaces! The kids started squeeling when they saw the giant cobwebs. Who knew they were so exciting? I ran out of fake spiders so I threw some bark into the cobwebs. Perfect. They look like dead bugs a giant spider trapped! So, with a few dollars we got the place spookified and by November 1st it will be ready for the Thanksgiving flowers! But my favorite part really is the fact that I don't have to feel guilty about the dead plants this week. WINNING! Do you decorate for the seasons? I'm excited to introduce the next blogger on the tour. I'm not sure if you've visited her blog but I've been reading it for quite some time. Fenna from FABulous is showing off some Go To Leggings she just whipped up! Perfect to put under dresses as the weather turns colder in the Northern Hemishere! Hop over to her blog to check out what she thought. You'll want to scroll through the blog to see all the childrens' clothing she makes! So much inspiration! The Go To Patterns Tour continues with Haley from Welcome to the Mouse House! Haley writes all about sewing, home decorating and DIY. You should see her beautiful house! And her very first sewing pattern released this week! She whipped up the Boardwalk Skirt this week and made the cutest little outfit! I love that trim! Darling! Stop on by the mouse house to see more details. And don't foget to look at her house photos and sewing/DIY tutorials. You can find her first pattern over here. Isn't this sweet? It's Make It Wear It Thursday! The time of the week to link up anything you've sewn, knitted, crocheted, glued, glittered or refashioned to wear. Anything goes! Link up what you've been making! Jess from If Only They Would Nap has four little boys, which should earn her a medal of some sort. She's seriously one of the sweetest and most generous people. I love her style and her blog is full of great inspiration if you love sewing for boys. Jess whipped up a Study Hall Jacket. She added her own flair and I love it! And he's about as cute as they come! Please stop by Jess's blog to check out all the great inspiration and tutorials. I love this simple advent calendar. Great timing for the holidays! Sabra from Sew a Straight Line is pretty much a sewing genius. She sews her own jeans and looks fantastic and not like she's wearing pajama jeans or jeans her grandmother made (no offense to grandmothers everywhere). She made the most amazing Study Hall Jacket a couple months ago and she's back with a simplified version that is just as amazing. I love this! Just perect! I need to make a few like this! Hop over to Sew a Straight Line to see more pics and get the details! And don't forget to subscribe and follow her while you're at it. Check out her tutorials, an exhaustive list of sewing lessons with a hilarious disclaimer and tons of boy sewing inspiration! This was one of my favorite collections of hers. Clothes for 3 boys that coordinate and are equally awesome. Next up on the tour is Mie from Sewing Like Mad. I've also had the privelege of meeting Mie in person and she's amazing. So kind and funny! And she can sew like nobodies business. She's a pro and everything she sews is perfect. She was just on Project Run & Play and performed amazingly. Mie whipped up another Study Hall Jacket. I love how she puts her own spin on everything. She made the fun button placket on this one. Great idea! Make sure you check out Mie's blog. It's full of inspiration and tutorials! I especially love this one. The next guest on the tour I can't say enough great things about. She's a fantastic friend and knows about everything so I always go to her with questions. You know her as Melly Sews and Blank Slate Patterns. Melissa has sewn up a couple Casual Ladies now but this dress she just made is adorable. If you want to know anything about sewing tips, tutorials, or how to blog or use photo editing software, Melly Sews is a blog you must follow. She's risen to the top as one of the most visited and popular sewing blogs and you'll see why! And don't forget to check out her patterns!! This is one of my favorites. More Casual Lady tops on tour! Melissa from Sew Like My Mom is joining to tour today. I have a soft spot for anyone with 4 little kids, like myself. Melissa is a fantastic sewist and I love seeing all the things she makes. Stop by Melissa's blog to see who took her photos. You'll be so surprised! Stacey always says yet when I ask her to sew something or be a guest. I'm sure you've seen her blog if you sew for boys. Boy, Oh Boy, Oh Boy is one of the best blogs to follow if you want inspiration for boy crafts and sewing. Stacey has made several Casual Lady tops. This may be one of my favorites. She added a cowl neck! On the tour today is Marissa from Rae Gun Ramblings. I love Marissa. She's such a fun person and is one of those etsy success stories. Her shop is AMAZING. And she sews it all herslef. Whoa. You'll want to follow her blog if you love sewing or reading. Every time I need a book recommendation I ask Marissa. She reads ALL THE TIME. Today she has a tutorial for making the Casual Lady into a cute, early pregnancy top. This is so cute! Justine has fantastic taste and puts so much care into all the garments she creates. I love that she sews for her teenage daughters, herself and her youngest daughter. There's hope your children won't outgrow wanting mom to make handmade! Sew Country Chick is a fantastic blog. Make sure you stop by and follow her! She whipped up the Anywhere Dress in a comic fabric I love. So fun and different! 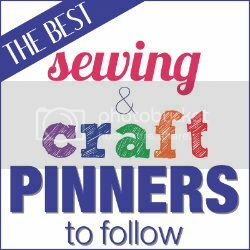 Make sure you stop by to see all the sewing tutorials, holiday projects and especially her sewing gallery. WOW. Thank you so much for participating, Justine! It's no secret that See Kate Sew is one of the most popular sewing blogs around. I'm so excited to show you what she did with the Go To Leggings! You'll want to stop by and see these! Adorable! The next stop on the sewing pattern tour is Abby from Sew Much Ado. I was on her Skipper Top Tour last week so it's fun that she's on my tour this week! If you aren't familiar with Sew Much Ado (of course you are), then you'll want to definitely subscribe to her blog. And don't forget to check out all her patterns! Ooh, I love cute little toddler legs!! Stop on over at Sew Much Ado to see what she thought of the Go To Leggings pattern. And don't forget to check out all her free tutorials and her patterns! I know I want to make myself the Seafarer Top!